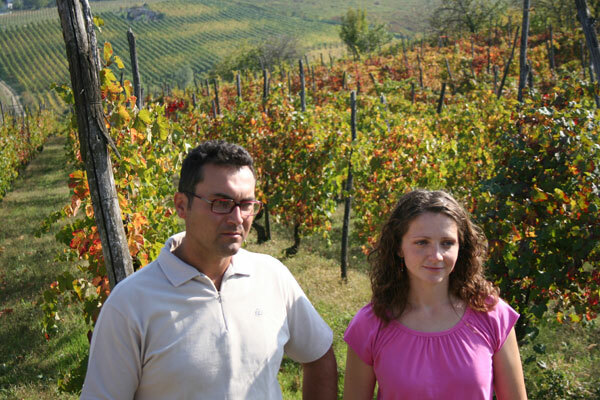 Marco Formaggini and Katia Peveri: we liked the idea of using our own names to identify our winery. The winery has actually been in our family for generations, but we decided just a few years ago to dedicate ourselves to it on a full-time basis. Our idea was to develop a line of high-quality Colli Piacentini wines and so it has been. Piacenza (Plaisance) is the most western province of Emilia Romagna just at the border with Lombardia and Oltrepo’ Pavese, here wine grows on charming hills where vineyards are part of a varied landscape of woods, corn and grass fields. Small quality productions for a craftmade wine making. A little interesting area in the wide survey of Italian wines! The most typical wine of Colli Piacentini is Gutturnio a red wine blend of Barbera and Bonarda, but also the white wines Ortrugo and Malvasia di Candia aromatica have now reached an interesting complexity. We propose both traditional semi-sparkling and pétillant wines and still structured wines to end up with sweet wine a Malvasia passito. Come to visit us, taste our wines and see our vineyards and you too can experience the land and the territory which we love and care for every day with our work. Order in the vineyards, care of our vines with integrated and non-invasive treatments, no chemical “magic” in the cellars, and honest work: these are our principles. Our prices reflect the same ethical principal: honest prices for quality wines. You can verify it for yourself when you come and visit us!